Guest Speaker Greg Thurston introduced by Kevin Watson: Greg was born in Perth and attended Tuart Hill High School. He has been in Rotary for 19 years and is married with three children. His hobbies are golf, hockey and ballroom dancing. He is also a Rottnest Island volunteer guide. District: Small scale, short term, local or international activities that must be completed in a year. Funding is on a $1 for $1 basis. Applications for our District 9455 close on 31/05. In the current financial years twenty five grants totalling $56,000 were awarded. Global: Large, long term with up to $30K US available per grant. Must be sustainable, measurable, and align with areas of focus. There is a world fund to match the $30K US. Applications are accepted at any time. 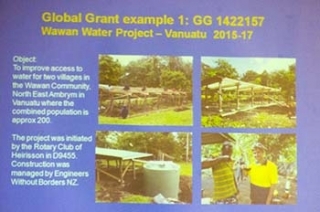 Greg then showed two examples of global grants with Australian Rotary clubs in operation one in Vanuatu and one in India. Some final information re polio – in 1988 there were 350,000+ cases of polio reported. Last year there were 33, all in the Pakistan/Afghanistan border area. 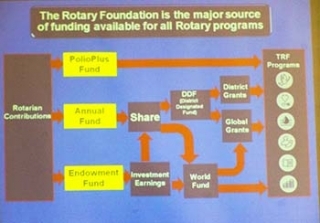 Polio eradication is one of several Rotary 'giving' programmes. Others include Centurion, Paul Harris, Bequests and Arch Klumph. 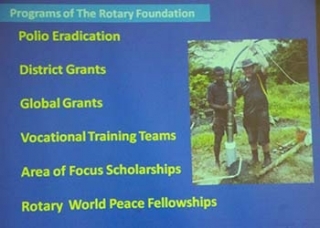 Kevin Watson: Is there ongoing Rotary monies for projects undertaken? Clark Scarff: How does global grants and financial leveraging work? Guest Speaker thanks from Geoff Watson.